Did Jeanie Buss consider trading LeBron James? 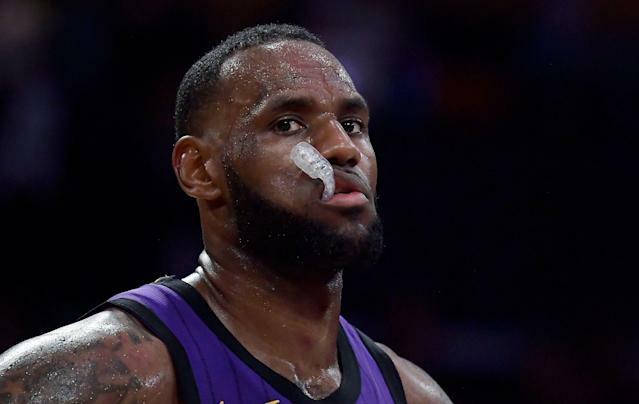 When ESPN analyst and former NBA coach Jeff Van Gundy suggested that the Lakers consider trading LeBron James, much of the sports world scoffed. According to Bleacher Report, he wasn’t the first to consider the idea. Of course the idea of trading away the cornerstone upon which all Lakers hopes are built because of anger with his agent is absurd. That the thought would have crossed her mind is also believable. The idea of Buss getting so fed up with the failed Davis talks that it would prompt irrational thoughts is not beyond the pale. Buss reportedly resorted to blaming the media in the ugly aftermath of the failed trade, relying on fake news taunts to deflect the reports that the Lakers were basically offering everyone not named LeBron in talks for Anthony Davis. The Lakers have since gone into full tank mode, with talk of resting James while not rushing Lonzo Ball and Brandon Ingram back from injury. While the idea of trading James out of spite for Paul is absurd — likely the same conclusion Buss eventually reached if the thought did indeed cross her mind — the thought of trading James is not. James is officially aging and appears to finally be on a physical decline, if even a slight one. If some contending team blew them away with an offer that included premium young talent, the Lakers would be foolish not to consider it. But those offers are not likely to come. The price would be too high to pay for a player who will be 35 next season. So we’ll all get to watch the drama unfold once again in the offseason, when a LeBron James-led Lakers team that missed the playoffs tries to pick up the pieces and build a contender.